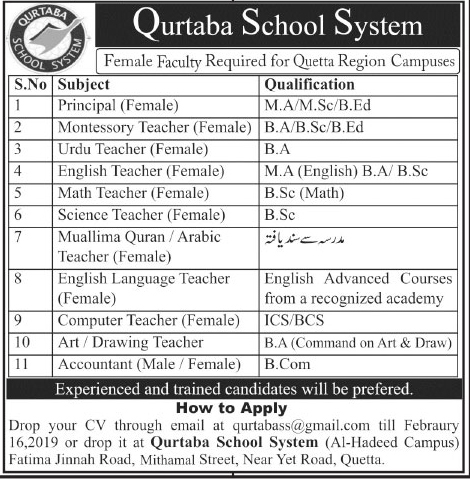 Jobs have been announced for teaching at Qurtuba School System. Qurtuba School System announces great jobs for women. Female Faculty required the Quetta Region Campuses. If you live in Quetta and are interested in typing, you should apply for this school's job. If someone has a teaching experience then he will be benefited more in this job. This is a private job, I will give you a great salary package. Drop your CV through email at [email protected] till February 16, 2019, or visit Qurtaba School System (Al-Hadeed Campus) Fatima Jinnah road, Mitcham Street, near yet road, Quetta.